Cold Air Distributors received the Federated Marketing Excellence Award. From left to right are:: Kerry Humphreys, Cold Air Distributors; Ken Bates, Cold Air Distributors; Phil Moore, senior vice president, Federated Auto Parts; and Denick Cobb, Cold Air Distributors. 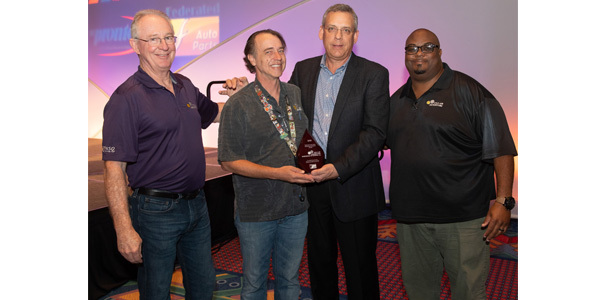 Federated Auto Parts recently honored three of its members – two companies based in Wisconsin and one in Florida – for their commitment to the group’s programs. Federated named Appleton, Wisconsin-based Automotive Supply Co. the Federated Co-Man Member of the Year. The annual award recognizes a Federated member that has shown outstanding support of the member-owned Co-Man warehouse operation and its programs. Rick Wood accepted the award on behalf of Automotive Supply. Fort Pierce, Florida-based Cold Air Distributors received the Federated Marketing Excellence Award. Ken Bates, Denick Cobb and Kerry Humphreys accepted the award on behalf of the company. Milwaukee-based Parts Distributing Inc. (PDI) received the Federated National Accounts Award. The top award recognizes a Federated member for excellence in serving national-accounts customers. Donovan Haidinger accepted the award on behalf of PDI.